Pris forsalg: Kr. 100,- + Avg. 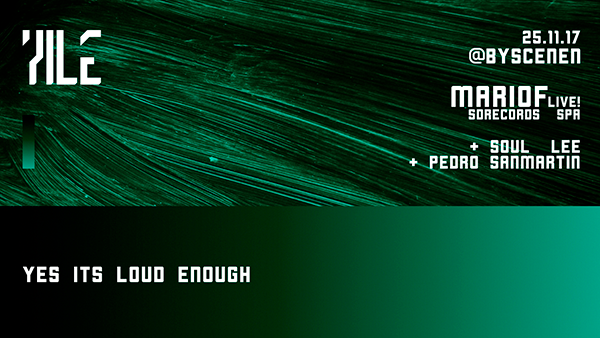 Yes it’s Loud Enough is a club-concept that was born on March 2017 from the need to create something that define us, and to share it with you. Share our love for electronic music, share our interests and different tastes, to create an alternative to the night-life in Trondheim. The concept has grown and evolved at different venues of the city, from verkstedhallen and lobbyen, Red Zone Night Club, Kulturnatt at Nyhavna, and now we find our self at Byscenen bringing international talent. This time we have worked hard to bring you something special. Straight from Barcelona, we present to you, MarioF, who will be presenting the latest release from his Spanish Label, Sonidos Distintos, with a hardware live set, acompained by our resident Djs Soul Lee and Pedro Sanmartin. We promise nothing more than a good music selection, great people and the perfect vibe, the rest you have to bring yourself. Forsalg på nett: Kr. 100,- + avg. – Billetter i døren: Kr. 130,- + avg.